William John Marks Thelning was born 12 June 1905 at Sydney, NSW, the son of John Joseph Thelning and his wife Florence. He married Irene Frances Donnelly (1906-1984) 6 December 1924 at Newtown, and they had three sons and a daughter. Thelning died 14 April 1967, aged 61 years, late of Blair Athol, South Australia, and he was cremated at Rookwood Cemetery. William Thelning lived in Darlington Road, Darlington. William Thelning was a Freemason and a member of the Manchester Unity Independent Order of Oddfellows Friendly Society. 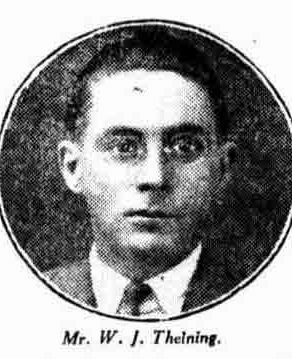 William Thelning was the Honorary Secretary of the Darlington Branch of the Labor Party C1923. He served as a Warrant Officer in the RAAF between 1942 and 1945 in World War 2. William Thelning was an alderman on Darlington Council in 1929-31 and 1934-37. In October 1930, it was reported that ‘Thelning is the youngest alderman in the Commonwealth, having celebrated his 21st birthday just prior to his election’.